Hydrodynamics is working with Gaelectric Development Ltd. to develop a CAES project in Montana for bulk energy storage to support their planned wind development. Hydrodynamics developed a numerical CAES system performance model of the East Keith gas reservoir. A detail geochemical analysis of the field was conducted. Air has never been stored in a depleted natural gas field for use as an energy storage system. It is unknown if chemical reactions between injected air and natural gas in a depleted field will create react rapidly, or if the oxygen in the stored air would be consumed by chemical reaction to the point that it cannot support combustion of natural gas in the turbine. It is also unknown if it is possible to create an air bubble in a depleted gas field that can store and deliver the required air mass flow rate at a pressure sufficient to operate CAES turbo-machinery. In addition to these basic research questions, we determined the viability of using the East Keith depleted natural gas field and the Huntley nitrogen/natural gas field as CAES air storage vessels. Hydrodynamics developed a numerical CAES system performance model of the East Keith gas reservoir using the TOUGH2 code. A detail geochemical analysis of the field was conducted to evaluate chemical reactions of air constituents with residual natural gas, rock, and groundwater to determine possible impacts on CAES system performance. Our simulation indicated that the East Keith gas field can support two 135 MWe CAES power generating units. The development of the East Keith depleted gas field will require the injection of approximately 20 billion cubic feet (BCF) of compressed air into the center of the reservoir to create an air bubble. The compressed air will displace the remaining approximately 5 BCF of natural gas to perimeter of the gas bubble. 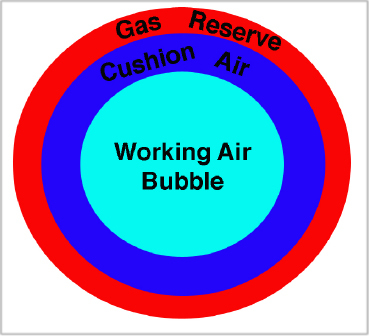 The resulting air/gas bubble can be divided in the three sections of 1) working gas center, 2) oxygen-free air cushion, and 3) natural gas periphery. Hydrodynamics designed an air injection program to enhance gas production to maximize removal and recovery of natural gas, and to test the technical feasibility of air storage in a depleted gas field. Our analysis of the Huntley aquifer structure focused on analysis of seismic reflection surveys to define the geologic structure of the target zone which is situated between and sealed by major faults.